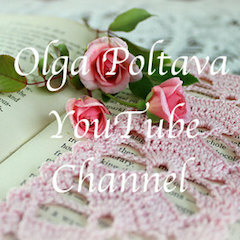 Here is an easy and quick lacy stitch. I can imagine making myself a summer top using this stitch. 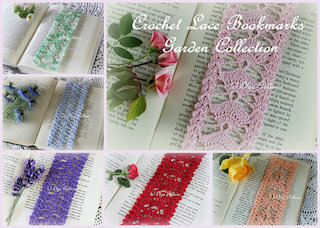 If only I had time for all the crochet projects I have in my mind! 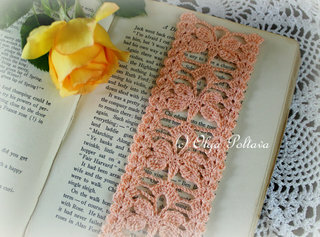 For the swatch shown below I started with ch 38. Row 1: sc in 2nd ch from hook, *ch 3, skip next 3 ch, sc in next ch* across. Row 2: ch 3, turn (counts as dc); 4 dc in next ch-3 space, *ch 1, dc in next ch-3 space, ch 1, 4 dc in next ch-3 space* across, dc in last sc. Row 3: ch 1, turn; sc in same beginning space, ch 3, *sc in next ch-1 space, ch 3* across to last 5 dc, skip next 4 dc, sc in last dc. Row 4: ch 4, turn (counts as dc and ch 1); dc in next ch-3 space, ch 1, *4 dc in next ch-3 space, ch 1, dc in next ch-3 space, ch 1* across; dc in last sc. Row 5: ch 1, turn; sc in same beginning space, ch 3, skip next ch-1 space, *sc in next ch-1 space, ch 3* across to last dc, skip last dc, sc in 3rd ch of turning ch-4. 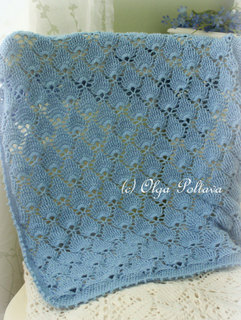 A new doily is complete! 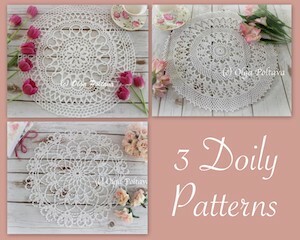 It is a vintage pattern from Doilies Lily Design Book No. 201 by Lily Mills Company, 1960. 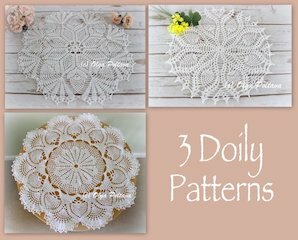 In the original publication this doily is called Pineapple Doily. But these "pineapples" look more like "pine cones" to me. 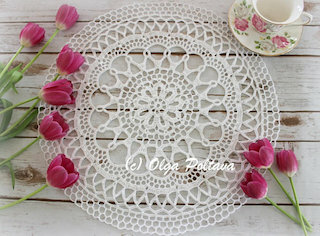 Either way, it is a very beautiful doily. Since it's a vintage one, I experimented with the Picasa's holga-ish setting to give my pictures "old" look. Wow, the pictures do look old, and gloomy, and even spooky... But I sort of like it! 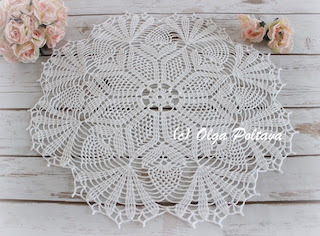 For my doily I used size ten crochet cotton thread, and a 1.25 mm steel hook. 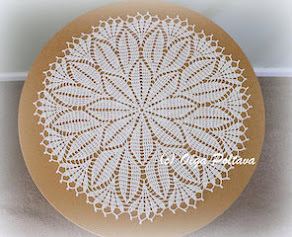 My doily came out quite big. It measures 24 inches in diameter. I like the pointy edging. And the best part is I didn't have to cut the thread and complete each point individually. Those points were actually all made in rounds. Starting in center, ch 12, join with sl st to form ring. 1st rnd: Ch 1, 16 sc in ring, join to 1st sc. 2nd rnd: Ch 1, sc in same place, (ch 5, sc in next sc) 15 times, ch 2, dc in 1st sc. 3rd rnd: (Ch 4, sc in next lp) 15 times, ch 2, hdc in dc at end of last rnd. 4th rnd: (Ch 5, sc in next lp) 15 times, ch 2, dc in hdc at end of last rnd. 5th rnd: (Ch 6, sc in next lp) 15 times, ch 3, join with dc in dc. 6th rnd: (Ch 7, sc in next lp) 15 times, ch 3, join with dc in dc. 7th rnd: (Ch 7, sc in next lp) 16 times. 8th rnd: In each lp make 1 sc, 1 hdc, 7 dc, 1 hdc and 1 sc. 9th rnd: Sl st to center dc of next scallop, ch 5, 2 tr in same dc, (ch 9, 3 tr in center dc of next scallop) 15 times, ch 4, tr in top of 1st 5-ch. 10th rnd: Ch 1, 3 sc in lp thus formed, (ch 14, 3 sc across center of next lp) 15 times, ch 14, join to 1st sc. 11th rnd: Ch 5, tr in next 2 sc, (ch 5, 2 sc in center of next lp, ch 5, tr in next 3 sc) repeated around, ending with ch 5, join to 1st ch-5. 12th rnd: Ch 5, tr in same place, * 1 tr in next tr, 2 tr in next tr, ch 6, make 2 sc over next 2 sc (covering them up); ch 6, ** 2 tr in next tr. Repeat from * around ending at **, join to 1st ch-5. 13th rnd: Ch 5, tr in same place, (2 tr in next tr) 4 times, (ch 6, 2 tr in each of next 5 tr) repeated around; ch 6, join to 1st ch-5. 14th rnd: Ch 1, sc in same place, sc in next 9 tr, (7 sc in next sp, sc in next 10 tr) repeated around, join to 1st sc. 15th rnd: Ch 5, holding back the last lp of each tr on hook make 2 tr in same sc, Y O and draw thru all 3 lps on hook for a cluster, * (ch 4, sk 2 sc, a 3 tr cluster in next sc) 3 times, ch 7, sk 7 sc, a cluster in next sc. Repeat from * around, ch 9, join to 1st cluster. 16th rnd: Sl st in next sp, ch 5, 2-tr cluster in same sp, * (ch 4, a 3-tr cluster in next sp) twice, ch 7, sc in next lp, ch 7, 3-tr cluster between next 2 clusters. Repeat from * around, join to 1st cluster. 17th rnd: Sl st in next ch-4 sp, ch 5, 2-tr cluster in same sp, * ch 4, 3-tr cluster in next sp, ch 10, tr in next 2 lps, ch 10, 3-tr cluster between next 2 clusters. Repeat from * around, join to 1st cluster. 18th rnd: Sl st in next sp, ch 5, 2-tr cluster in same sp, (ch 14, tr in next 2 lps, ch 14, 3-tr cluster between next 2 clusters) repeated around, join to 1st cluster. 19th rnd: Sl st to 10th st of next lp, ch 5, tr in next ch-14 lp, * ch 12, long tr in next cluster: To make long tr, Y O 5 times, insert hook in cluster, Y O and draw thru, (Y O and draw thru 2 1ps) 6 times. Ch 12, long tr in same cluster, ch 12, tr in next 2 ch-14 lps. Repeat from around, join to top of 1st ch-5. 20th rnd: Sk next tr, sc in next lp, * (ch 3, sc) 4 times across same lp, ch 3, sc in next lp, (ch 3, sc) 5 times across same lp, ch 3, sc in next lp, (ch 3, sc) 4 times across same lp, sk 2 tr in angle, ch 1; sc in next lp. repeat from * around. Ch 1, join to 1st sc. 21st rnd: Sl st and sc in next ch-3 lp, * (ch 3, sc in next lp) 6 times, ch 7, skip, sc in next lp, (ch 3, sc in next lp) 6 times, sk 1 ch in angle, sc in next ch-3 lp. Repeat from * around, join to 1st sc. 22nd rnd: Sl st and sc in next lp, * (ch 3, sc in next lp) 5 times, 9 sc in next ch-7 lp, sc in next ch-3 lp, (ch 3, sc in next lp) 5 times, sk angle, sc in next ch-3 lp. Repeat from * around, join to 1st sc. 23rd rnd: Sl st and sc in next lp, *(ch 3, sc in next lp) 4 times, ch 5, (dc, ch 5, dc) in center sc on next lp, ch 5, sc in next ch-3 lp, (ch 3, sc in next lp) 4 times, sk angle, sc in next lp. Repeat from * around, join to 1st sc. 24th rnd: Sl st and sc in next lp, (ch 3, sc in next lp) 3 times, * 5 sc in next sp, sc in dc, 7 sc in next sp, sc in dc, 5 sc in next sp, sc in next ch-3 lp, (ch 3, sc in next lp) 7 times. Repeat from * around, end with 4 ch-3 lps, joining to 1st sc. 25th rnd: Sl st and sc in next lp, (ch 3, sc in next lp) twice, * ch 5, dc in sc above next dc, ch 5, (dc, ch 5, dc) in 4th (center) sc of next sp, ch 5, sk 3 sc, dc in next sc, ch 5, sc in next ch-3 lp, (ch 3, sc in next lp) 6 times. Repeat from * around, end as in last rnd. 26th rnd: Sl st and sc in next lp, ch 3, sc in next lp, * (5 sc in next sp, sc in dc) twice, 7 sc in next sp, (sc in dc, 5 sc in next sp) twice, sc in next ch-3 lp, (ch 3, sc in next lp) 5 times. Repeat from * around, end as in last 2 rnds. 27th rnd: Sl st and sc in next lp, * (ch 5, dc in sc above next dc) twice, ch 5, (dc, ch 5, dc) in 4th (center) sc of next sp, (ch 5, dc in sc above next dc) twice, ch 5, sc in next ch-3 lp, (ch 3, sc in next lp) 4 times. Repeat from * around, end with 3 ch-3 1ps, ch 1, join with hdc in 1st sc. 28th rnd: Sc in lp thus formed, * (5 sc in next sp, sc in dc) 6 times, 5 sc in next sp, sc in next ch-3 lp, (ch 3, sc in next lp) 3 times. Repeat from * around, end with 2 ch-3 lps, ch 1, join with hdc in 1st sc. 29th rnd: Sc in lp thus formed, * (ch 5, dc in sc above next dc) 3 times, ch 5, (dc, ch 5, dc) in 3rd (center) sc of next sp, (ch 5, dc in sc above next dc) 3 times, ch 5, sc in next ch-3 lp, (ch 3, sc in next lp) twice. Repeat from * around, end with one ch-3 lp, ch 1, join with hdc in 1st sc. 30th rnd: Sc in lp thus formed, * (5 sc in next sp, sc in dc) 8 times, 5 sc in next sp, sc in next ch-3 lp, ** ch 3, sc in next lp. Repeat from * around, ending at **, ch 1, hdc in 1st sc. 31st rnd: Sc in lp thus formed, * (ch 5, dc in sc above next dc) 4 times, ch 5, dc in 2d (center) sc of next sp, (ch 5, dc in sc above next dc) 4 times, ch 5, sc in next ch-3 lp. Repeat from * around, join to 1st sc. 32nd rnd: * (5 sc in next sp, sc in dc, ch 4, sl st in last sc for a p) 9 times, 5 sc in next sp, sk sc in angle and repeat from * around. Join and fasten off. 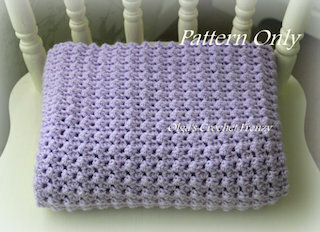 I usually work on three-four crochet projects at a time, so that when I get bored with one, I can switch to working on another. The yarn I'm working with is Woolike by Loops &Threads (85% acrylic 15% nylon). It's category one yarn. The color is ivory. Since it's a super fine yarn, the work is progressing slowly, even when I don't do unraveling. The stitches are small and completing even one round takes some time. 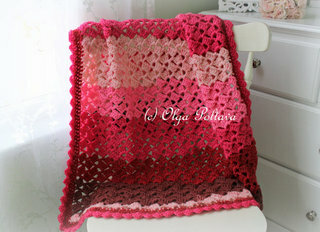 So having other crochet projects on hand is nice. But this dress is coming out very soft and light in texture. There is still a long way to go before it will be finished, but I cannot wait to see how it will turn out. I plan to add more lace to the shoulders and to the collar. 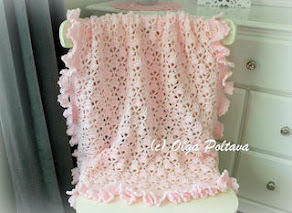 What crochet project are you working on right now? And how many projects do you have started at the same time? 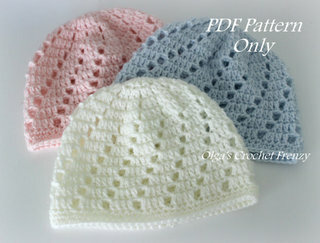 Two of the most popular patterns in my Etsy shop are the patterns for the cloche summer hats shown below. These two hats are size 3-5 years old. A lot of people have written to me asking about a similar hat pattern but for a smaller size. And finally here it is! 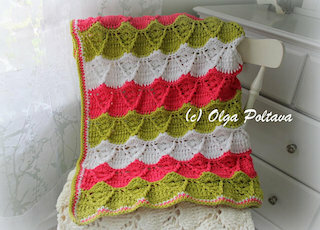 I made it with the same yarn (Grace by Patons) in my favorite color combination - light green and pink. The finished hat measures about 18.5 inches in circumference and 7 inches in hight (including the brim), and should fit a girl 1-2 years old. The pattern is very detailed. 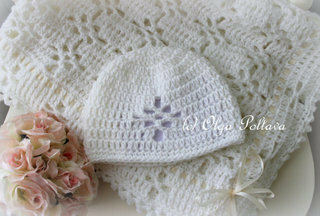 It includes the pattern for the flower and the instructions on how to shape and starch the hat.